HomePATHOGENESIS! Or, what’s in a name? PATHOGENESIS! Or, what’s in a name? 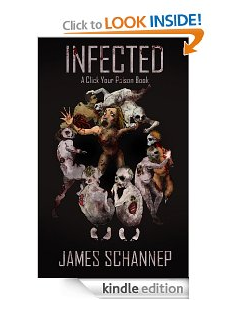 I like it as a title because it’s a disease vector, as in, how an infection starts. After all, this is a prequel. Also, it would be my first plural title, because it’s the first disparate story, with plural protagonists. And…you know…paths. Choices. Get it? I may still keep the other as a subtitle. “PATHOGENS: INFECTED Origins” or something like that. Yes and no. The anti-aging medication was delivered via gene therapy, so it’s considered a retro-virus, I believe (because the new gene is delivered virally). So the host is “infected,” even though the source of the whole apocalypse is from genetic engineering. As of now, this is the only planned spinoff CYP book. Aw yes, now I recall. Retro virus. Well I will still say, keep your brand. Click Your Poison is the brand, my friend! Click Your Poison is to Ford as Infected is to Explorer. So…the new book can be an Escape? Which makes MURDERED a red Bronco and SUPERPOWERED, umm, a Tesla. Pathogens is pretty good. What about “Patient Zero”? Or had that title been done to death? Yeah, done to death (pun not intended?). I actually think PATHOGENESIS is a pretty great title, although it’s not a past participle. PATHOGENERATED? I vote that you rip that band-aid off now and call it Pathogenesis. I think you call it PATHogenesis and put me in the book!!! It’s funny, I only put Pathogenesis as a title for the blog, but so many people seem to like it. I’m still not sure. It seems…long.